Is Social Media Part of Your Gratitude Program? Nonprofits often have a hard time acquiring and retaining longtime donors. It's not uncommon to lose as many donors as gained or to lose as much money in donations as gained, making the entire effort seem like running on a treadmill: a lot of effort but no forward movement. They must receive a timely and meaningful acknowledgment of their gift. In practical terms, the acknowledgment should be immediate and consist of more than just a receipt. They must have an opportunity to assist a particular project rather than the “general operating” bucket. They must understand the impact of their gift and what it helped to accomplish. It's important to provide all three of these things to your donors every single time they make a donation—even when you are not asking for money. Your donors want and need to hear from your organization frequently, and social media is a perfect way for you to stay atop their minds while acknowledging their generosity and support. Social media isn't a replacement for personal techniques like thanking donors face-to-face or through phone calls, handwritten thank you notes, and appreciation events. However, it is worthwhile to start thinking about the different ways you can use online communities like Facebook and Twitter to further cement relationships with donors and to showcase the great work that you do every single day. 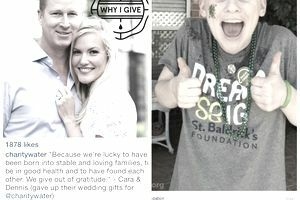 There at least 10 low-cost and simple ways to use social media to thank donors and supporters. The best long-term strategy to thank donors and encourage them to remain a part of your nonprofit community is to share consistently practical, useful, and valuable information. You can find this information by thoroughly understanding your donors and what makes them tick. What interests them? What resonates? What sparks an action? What falls flat? By connecting your donors to other resources that they may find valuable, sharing helpful information, and providing useful tips and content, you show them that you are listening and that you understand them. In return, they may engage with you on social media and share your posts with their networks. The American Red Cross is a good example of an organization that shares helpful, relevant tips on its Facebook page and blog. Think about the most frequently asked questions that you receive from donors. Craft a short response to each question, add a great visual, and you’ve got a useful and informative Facebook post. For extra credit, put donors' names in the post and tag them or their company to build the relationship further—with their permission of course. The NonProfit Times provides some good examples of frequent questions that donors ask, and ColoradoGives sets a good example of a useful FAQ page. Showcasing the generosity and passion of your donors will help you stand out in a cluttered news feed and encourage donors to share the post with their networks. Project AWARE and Sport Diver Magazine choose a monthly #DebrisHero and feature their story and photo on their social media accounts. These people may be donors, volunteers, or legislators who have demonstrated a commitment to keeping the oceans clean. Make a Twitter list of your donors, corporate sponsors, funders, and major supporters. Also, set up Google alerts for this same list of people and their companies. This way you can easily monitor their tweets, blog posts, and news stories and share their content on your social media channels. By showing that you are paying attention and acknowledging their other achievements—beyond just donating to your organization—you will build even better relationships with these donors. You’ll also learn more about them, which always an effective fundraising strategy. Facebook Live and Instagram are mobile apps that allow you to take videos and share them from any mobile device. Using just your smartphone, you and your staff or your volunteers can make a short and sweet thank you video for donations as they come in. Offer your donors exclusive access to your top officials through a live Google Hangout or webcast on Facebook. Experiment with live streaming apps like Periscope or Meerkat and provide a live, behind-the-scenes look at an event or program. The Gates Foundation, for example, uses live Facebook Q&As to give their supporters access to Bill Gates and to promote their work and mission. Showing your impact is by far the most important way you can use social media to thank donors. Tell them where their money went and thank them for helping to make the world a better place by sharing regular, meaningful updates on your clients, your work, and your impact. Boston Children’s Hospital frequently shares impactful posts on their Facebook page, often showcasing the story of a patient who was helped by the hospital. Donor churn often can be a result of poor customer service. The cure can be as easy as responding to questions and comments whenever they come in. Do not shy away from debates and conversations on your social media channels. Chime in where appropriate or direct people offline to further address their concerns. Create a transparent online culture where donors and other members of your online community can ask questions and voice opinions. Whatever you do, do not delete comments or questions unless they are obscene or spam. Responsiveness is directly measured and reported right on your Facebook page. How does your Facebook page measure up? Girls Inc. stages a “30 Days of Gratitude” campaign to thank their donors, using a multichannel approach involving social media. The Wellbody Alliance takes to its blog and social media channels twice per week in November to express gratitude for their donors, employees, volunteers, and partners. Through visuals and graphics, Wellbody tells the story of one or more people they feature. Start an exclusive Facebook or LinkedIn group for your donors. Creating a group like this for donors who also fundraise on your behalf is especially gratifying since they can then share best practices, ideas, and give feedback on each other’s campaigns. Donors are people too, and they have careers and professional interests of their own. Helping them advance and build their networks is a fantastic way to give thanks.